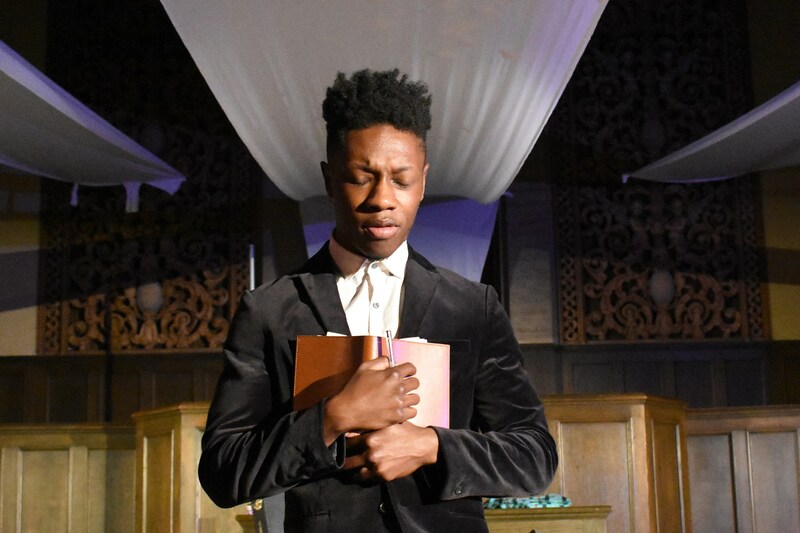 Marcus (talented Michael Curry) recites poetry as he fumbles through puberty and on to adulthood, the mediator for his fractured family. 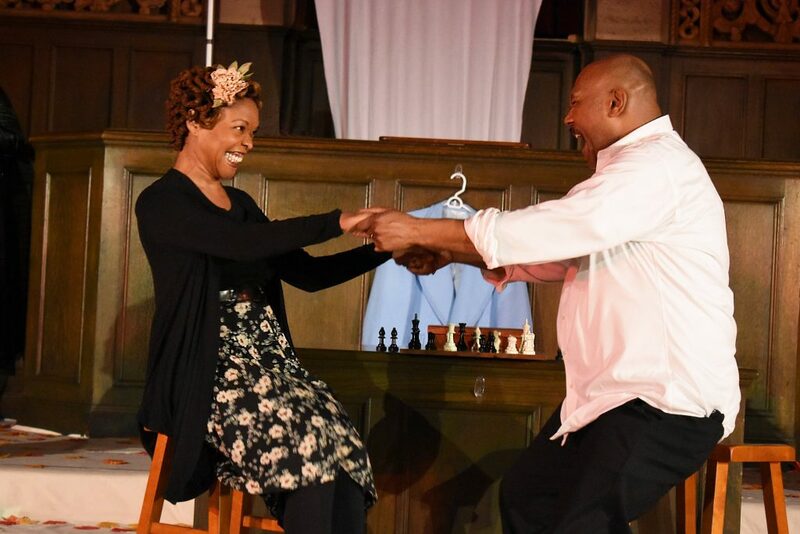 Ubuntu Theater’s “Dance of the Holy Ghosts” by Marcus Gardley uses the talents of an all-Black cast to tell a powerful Oakland story in music and poetry. 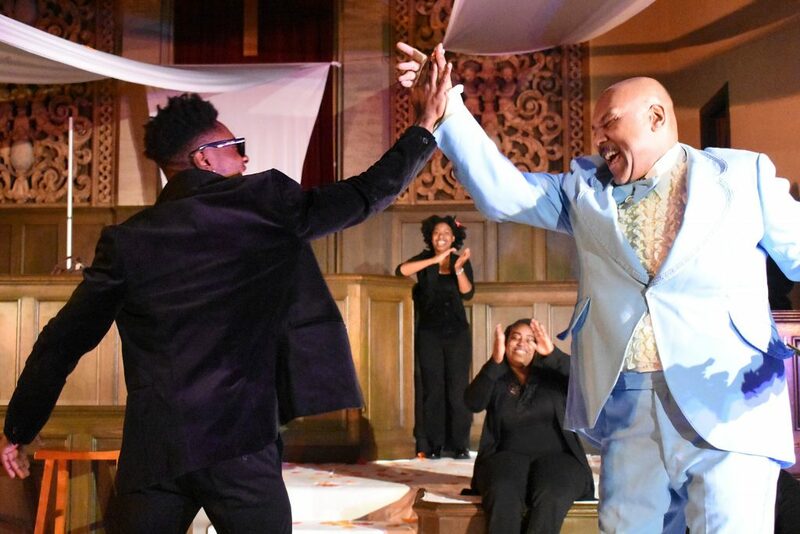 As we enter the Oakland Peace Center, Director Michael Socrates Moran’s impressive cast of versatile actors and gifted singers sweep us away with stirring gospel singing. We sit in pews facing Hector Zavala’s redesigned altar that features boxlike platforms forming a versatile stage set. Moran spreads the action over the entire church, with actors entering from the back and sides and a dramatic final scene. Irascible Oscar Clifton (powerful Berwick Haynes), patriarch of his estranged family, dominates the stage. His grandson Marcus, who appears as a ten year old and as a young man, leads us through his grandfather’s memories. 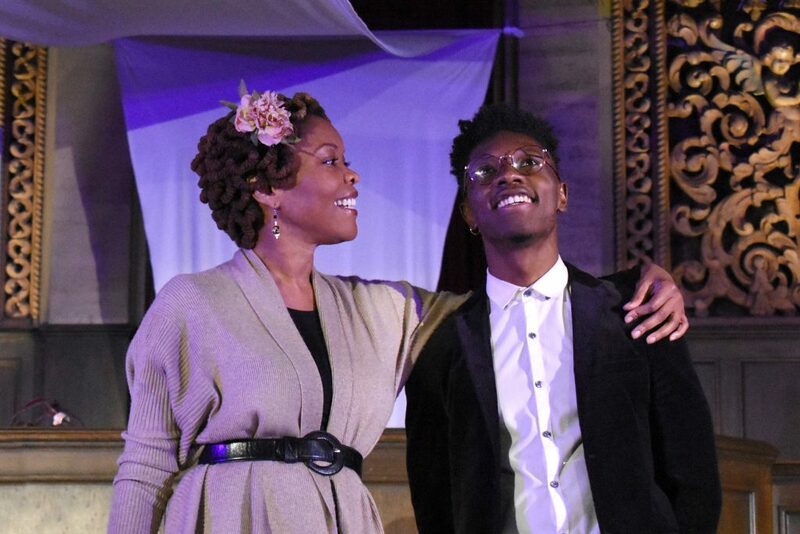 The most powerful moments for me come from the moving Gospel singing of the Ensemble, directed by Branice McKenzie. Both Oscar and Viola Tanisha (soaring Halili Knox) sing stirring solos, leaving us hanging on their every note. Much praise to the singers and their director for the great music. Between grandfather Oscar’s crass trash talk and “playing the dozens” at school, Marcus G manages tender moments. He expresses his love for his first crush, Tanisha (vivacious Halili Knox, again). His poetry, haunting and lyrical, leaves us wanting to hear it again. Clearly an autobiographical work, Marcus G presents the playwright in his early days. Based in Oakland, Gardley’s hometown, among well-known streets and bus lines, we feel close to his story. “Dream of the Holy Ghosts” depicts a stark, family drama, covering several generations before settling on the reassuring theme of passing the torch. Despite infidelities and oppressive poverty, Marcus’ family comes to the rescue. When his estranged daughter Darlene (wonderful, passionate Elizabeth Jones) dies, Marcus begs his grandfather to come to her funeral. 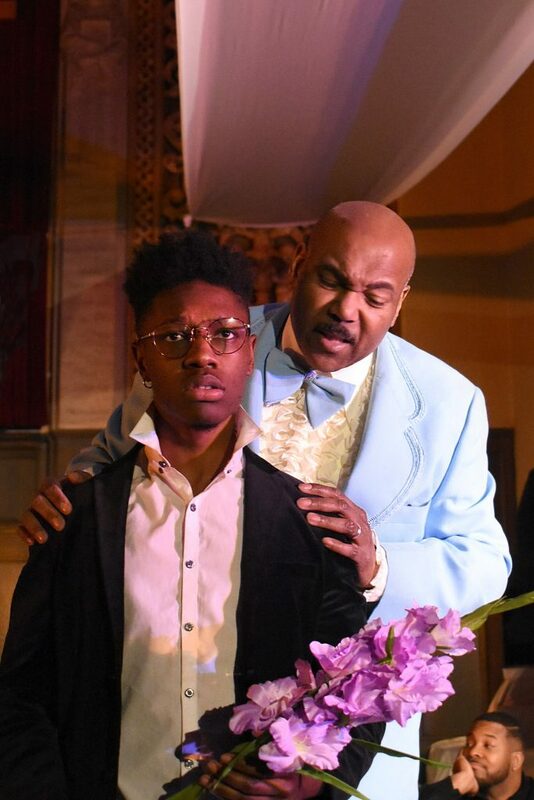 Oscar replies, “I don’t do funerals, they really do too much talking!” However, when Marcus picks him up, Oscar appears decked out in a loud, powder blue Tux with ruffled shirt. Over Marcus G’s protests, the patriarch proudly announces that he wore the same damned suit at Darlene’s wedding. “Dance of the Holy Ghosts” moves swiftly from humor to sorrow and finally, to acceptance of the inevitable cycles of life. The play lifts us up, as we witness Marcus enduring tragedies that would break most of us. Marcus reacts by forging his own future. 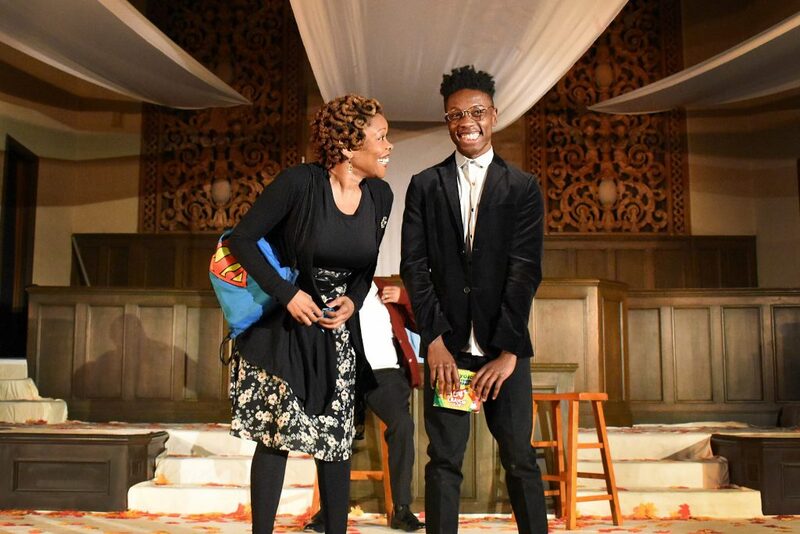 A play well worth seeing from the pen of one of America’s rising stars. Don’t miss it! Anthone Jackson, Elizabeth Jones, Njeri Kamau-Devers, Halili Knox, Kahli Leneus, Alicia McCauley, William Oliver, Brittany Sims, and Rahel Zeleke.